As we hang on to the end of summer with white knuckles (okay, it is the beginning of autumn but I am still hanging on!! 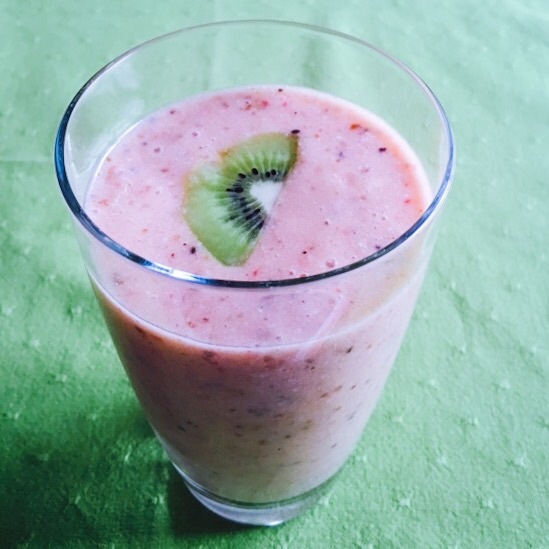 ), I am reminded of a lovely tart which inspired this smoothie. It was a simple tart on a pate sucre base, topped with a sweet cream cheese mixture and beautifully covered with meticulous rows of strawberries upon kiwi fruit. Absolutely summer. I wanted a smoothie to capture this loveliness somehow, and I am thrilled at my result. I have focussed on coconut milk and coconut oil to capture the dairy free equivalent to the creamy filling and it works really well. Ideally the banana or strawberries are frozen, but if you are using all fresh fruit then add in some frozen coconut milk or ice cubes to give it a nice thick consistency instead. Place all the ingredients above in your blender and blend until smooth. Serve immediately.